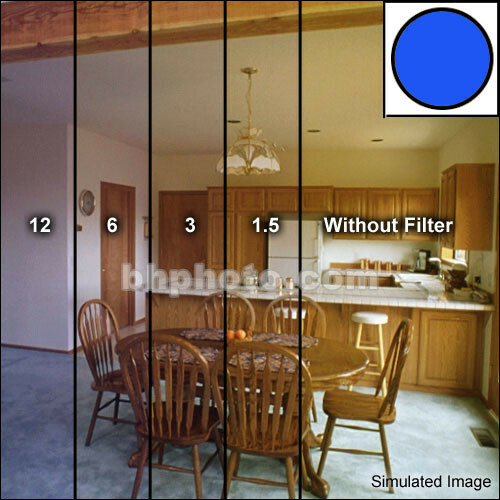 A filter that produces a color temperature change of 100 deg. K at 3400 deg. K will produce a change of 1000 deg. K at 10,000 deg. K. This is because the filter relates to a visual scale of color. It will always produce the same visible difference. A color change of 100 deg. K at the higher temperature would hardly be noticed. To allow simple calculation of such differences, we convert the color temperature into its reciprocal, that is, to divide it into "1." Then, since this is usually a number with six or more decimal places, we multiple it by 106, or one million, for convenience. This is then termed the "mired value," for micro reciprocal degrees. It identified the specific change introduced by the filter in a way that is unrelated to the actual temperature range involved. From this, you can see that, although the degree differential varies as the range changes, the actual filtration difference for these examples, in mireds, is the same. To use this concept, subtract the mired value of the light source from that of the film. If the answer is positive, you need a reddish filter; if negative, use a bluish filter. Mired-coordinated filters are termed as decamireds. Mired value divided by ten yields decamireds. The 60 mired shifts, above, would be produced by an R6 filter, where the higher values were that of the lighting. Sets of such filters generally come in values of 1.5, 3, 6, and 12 decamireds in both B (bluish) and R (reddish) colors. These numbers are additive; that is, a pair of R3's produces an R6. An R6 plus a B6 cancel each other out to produce a neutral gray.